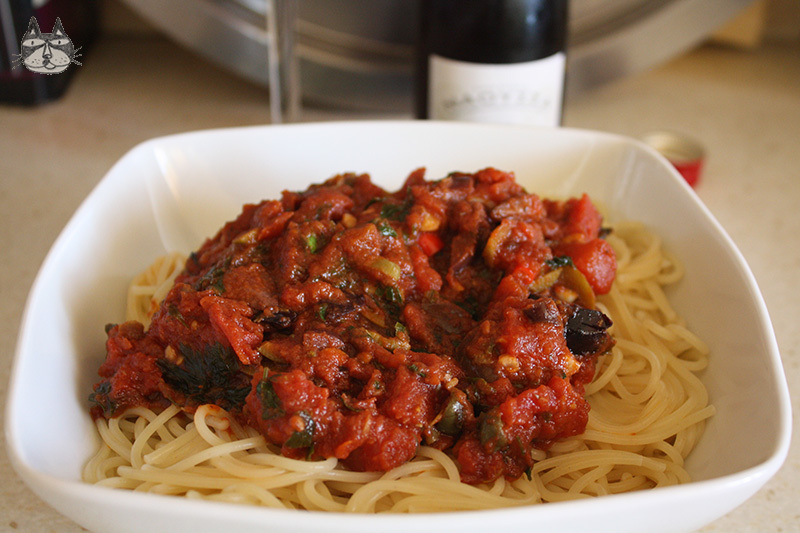 The Puttanesca pasta sauce is a tasty mix of tangy, salty and spicy hot flavours. Puttanesca literally means ‘whore’ and Sugo alla Puttanesca means ‘Whore’s style Sauce’. According to Annarita Cuomo, writer for Il Golfo, a daily newspaper serving the Italian islands of Ischia and Procida, sugo alla puttanesca was invented in the 1950s by Sandro Petti, co-owner of Rancio Fellone, a famous Ischian restaurant and nightspot. In the February 17th, 2005 edition of the newspaper, Cuomo says the moment of inspiration came, when near closing one evening, Petti found a group of customers sitting at one of his tables. Petti was low on ingredients and told them he didn’t have enough to make them a meal. They complained that it was late and they were hungry. “Facci una puttanata qualsiasi (Make any kind of garbage),” they insisted. In this usage, puttanata is a noun meaning something worthless. It derives from the Italian word for whore, puttana.At the time, Petti had nothing more than four tomatoes, two olives and some capers; the basic ingredients for the sugo. “So I used them to make the sauce for the spaghetti,” Petti told Cuomo. So you see, it has nothing to do with the smells wafting out of a brothel kitchen window attracting customers or any of the such stories, even if I personally preferred the sordid kind. The first time I had this, I was a student. It was a friend’s birthday dinner party and a whole bunch of us went to an Italian restaurant. The name of the pasta made a few of my friends giggle (and more of the boisterous kind) and out of curiosity, quite a few of us ordered it. And since then I have fallen in love with this pasta sauce with the naughty name. You can use the sauce with any sort of pasta that you like – I quite like spaghetti, personally, and the thinner it is, the better. I usually get the ones sized 10 (but I have recently found one that’s sized 12! It’s nearly as thin as bihun! Love it!). I sometimes make it with penne for George. You can serve it with grated Parmesan cheese on top, but the sauce would already be rather salty, so this is a matter of choice. Some people have to have their pasta with some sort of cheese on top. This recipe isn’t an authentic one – I add onions while a lot of other recipes don’t. I wanted to add some sweetness to the sauce, and as it is already spicy, salty, sour and full of umami flavours (from the anchovies) I thought let’s make it an even 5! It makes the sauce thicker, too. 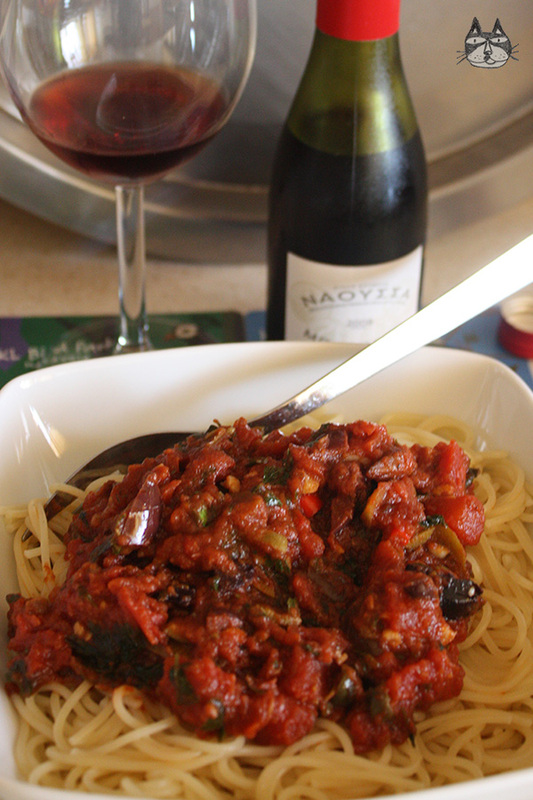 This is also one of my sister’s favourite pasta sauces, and hey Ainaa, this is for you! 1 clove of garlic, chopped fine. 2 tbsp of olive oil, or more according to taste. Heat the olive oil in a pan. 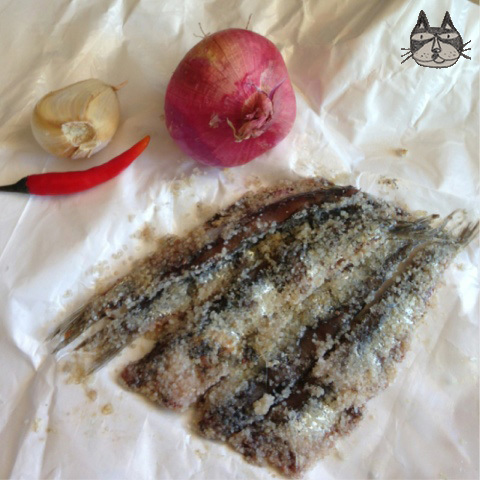 Once hot, add the chopped anchovies and cook until it has ‘melted’ and melded with the olive oil. Add the onions and sauté until translucent. Add the garlic and the chillies, and cook, but don’t burn the garlic! Add the chopped tomatoes, and cook for about 5 minutes. 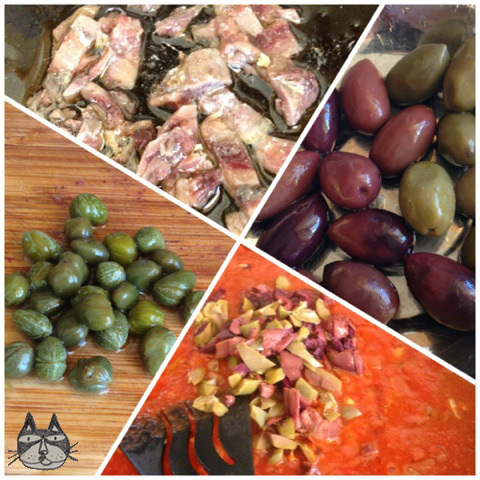 Add the capers and olives and cook until the sauce has thickened. Add the oregano, and stir for a minute or two. Take off the fire, and stir in the chopped parsley. Serve with the pasta of your choice! If the sauce is too thick, when mixing the pasta to the sauce, add a bit of pasta cooking water to the mix.